Because football is such a high impact and physically taxing sport, you can easily injure yourself while throwing a football. Arm pain can come from many training errors and conditions, some that require a doctor's treatment. 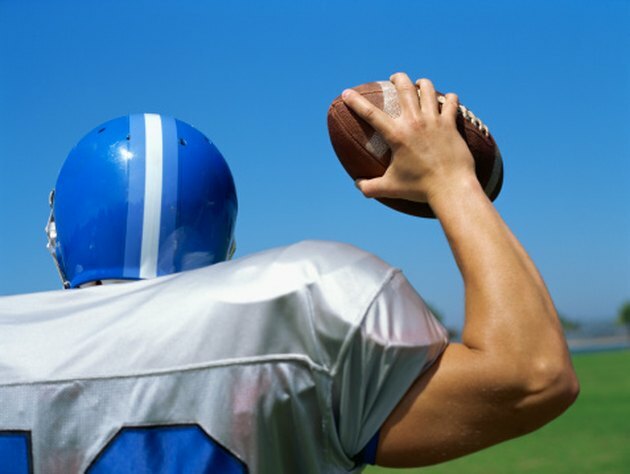 Because pain can be excruciating, it is important to understand what can cause arm pain during or after throwing a football and how you can remedy it. Football-related arm pain can vary from mild to severe. It can be localized to particular spots of the arm, such as the bicep, or occur throughout the entire arm, shoulder and hand. Additional symptoms can include numbness, skin discoloration, the sensation of pins and needles, swelling, instability, loss of mobility and tenderness. Symptoms can worsen when you lift your arm up over your shoulder. You may feel or hear your arm or shoulder 'popping out" at the time of injury. Throwing a football excessively or not taking breaks as needed can dislocate the upper arm bone from the shoulder socket or damage the ligaments, muscles or tendons in the arm, resulting in pain and injury. Frequent throwing can also cause the inside of the elbow to stretch while compressing the outside of the elbow. This can result in small bone fractures, bone spurs, ligament strains and bone chips. Bicep tendonitis or stingers, where a direct blow to the neck compresses the nerves and sends a stinging sensation down the arm, can also trigger arm pan while throwing a football. Rest your arm and immobilize it with a sling if possible. Hold an ice pack or heating pad against the painful area to help ease arm pain and swelling. Gently massage your arm to help remove any scar tissue and encourage the healing process. Take ibuprofen or acetaminophen to reduce pain and other symptoms. When the pain is gone, gently stretch out your arm and do strength training exercises such as bicep curls to help strengthen the muscles and prevent future injury. Do not ignore shoulder pain as the result of throwing a football. Failing to treat the injury can cause the muscles, ligaments or bones to heal out of place, which can create future pain or injury. Seek medical attention if symptoms are chronic, severe or do not respond to home treatment. These could be symptoms of a more serious injury such as a fracture, which may require surgery.